Hello beauty junkies, if you follow me on twitter you will know how much I hate generic beauty reviews, I just don't read them when I scroll through Bloglovin and see 19307542 posts about the same lipstick or foundation, usually sponsored by the brand which you can tell by a mile off. 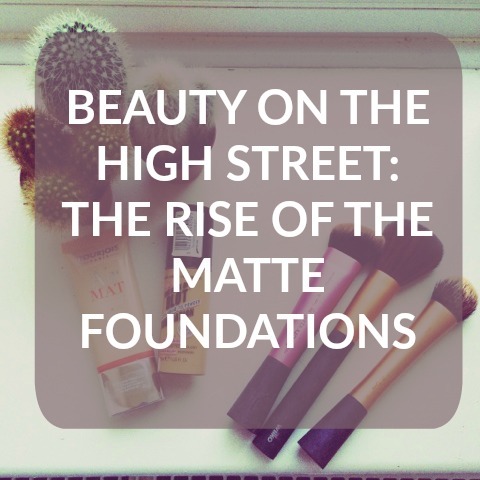 You'll be pleased today I am bringing you a beauty post that isn't sponsored by either brand but I desperately need to tell you about these marvellous new foundations that have recently landed on the high street and subsequently into my make up bag. I am a SUCKER for a matte finish, having unbearably oily skin means that I can never hold a foundation to my face for longer than an hour. My nose is the bane of my existence, not only is it huge, my foundation just slides down the slope, anyone feeling my pain here? I thought there was no helping it and I almost accepted my fate to be an oily mess forever UNTIL these two foundations entered my life, I will be giving you a review of each foundation and I will say now go out and buy them both if you can, however if you're on a tighter budget read the reviews and decide which one you'd suit best. Before I review the foundations I must stress that to apply a matte foundation with the intensity of these products I would highly recommend purchasing a Real Techniques Miracle Complexion Sponge, FeelUnique £5.99. I could not achieve the high quality finish I achieve with these foundations without it. If you follow me on social media or you know me well, you will know how much I adore Bourjois. In my opinion they make the best smelling products and best quality packaging on the high street. They are extremely good value for money, it's a stand out brand on the high street for me and I just can't fault them at all. My first impressions of this foundation were extremely impressed, it glides on like a dream and smells delightful. The packaging is light, youthful and in a handy squeeze tip tube which is wonderful for makeup on the go and travelling. I have a bulbous head so my face is huge, I would say I need 4 beads of this when applying on a daily basis for work, when I am going out and need it to work hard it delivers wonderfully, however, I would say you need to build probably 3 layers and use around 12 beads of it to really achieve that high coverage finish. It claims to achieve 24 hour coverage, it definitely stays in place for my entire day so from 7am - 5pm and requires NO touch up or blotting AT ALL. If I hadn't discovered the foundation that follows this review I would be going through about 4 bottles of this a month, and that really is the only downfall on this product. I would 1000000% recommend buying this foundation if a medium coverage finish is what you're looking for. 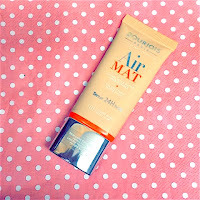 I wear this religiously for work and unlike many other matte foundations really, really, really allows your skin to breathe and doesn't feel tight when it sets at all. At only £9.99 you can't go wrong and it is now my go to daily foundation and will be for a very long time. 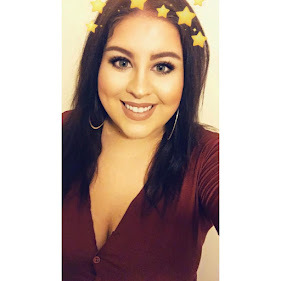 Soap & Glory are a great brand who are taking the high street makeup departments by storm, I am in awe of the quality of products that they produce and my everyday makeup routine is full of their collection from Brow Archery to Solar Powder, I can't do without them and now this foundation has stolen my heart. I have been looking for a matte high coverage foundation that just does EXACTLY what it says on the bottle for so long, ever since Clinique discontinued the original RepairWear. 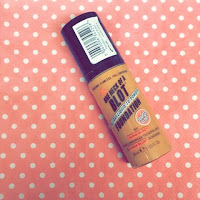 It's taken me 3-4 years but I have found my foundation favourite and I have fallen head over heels. If you love Estee Lauder Double Wear but can't afford the price tag, this foundation is the PERFECT dupe. One Heck Of A Blot requires just one layer to achieve full coverage in an instance, it takes no more than 4 beads from the excellently designed pump to hide every blemish and imperfection that has been a problem in the past. The only thing I will say is to NOT over do it with this foundation, when I say it requires one layer I mean it. Just like Estee Lauder if you get a little over confident with the sponge it can become very cakey and very tight. I receive copious amounts of compliments when I go out wearing this foundation and I am always being asked where it's from and when I tell them what it is and how much it costs they just can't believe it. If you LOVE full coverage, if you LOVE a matte finish, if you LOVE a flawless complexion, you must go and buy this foundation right now. I hope you have enjoyed this post, like I have said before I am not a great fan of beauty reviews but I just HAD to tell you beautiful people about these wonderful foundations. They have changed my makeup routine forever and I know there are many girls and women out there who feel my pain with oily skin, our time in the dark is over these two foundations will improve the finish of your makeup without a doubt. Leave me a comment below if you currently use either of these foundations and let me know if you like my beauty reviews or what you would like to see on my blog over the Christmas period.